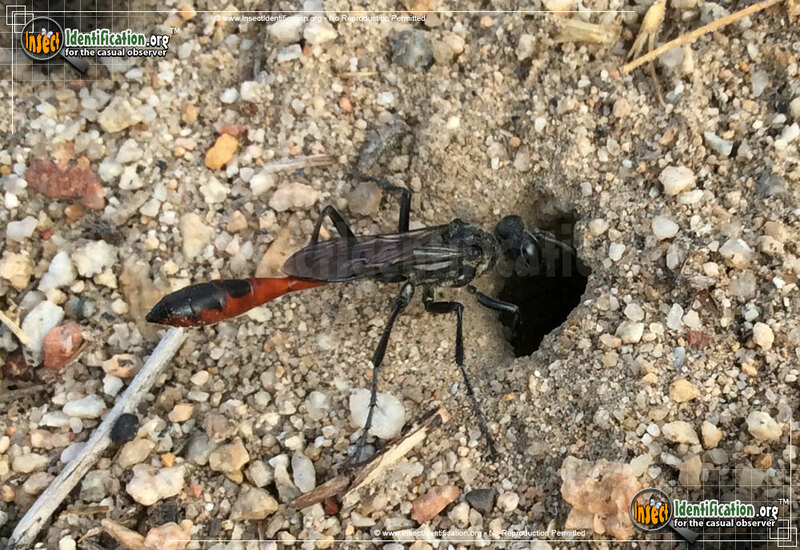 Fans of sandy soil, the Thread-waisted Wasps from the Ammophila genus use the loose earth to house their offspring. Incredibly narrow waists are a standard feature on Thread-waisted Wasps. Female Thread-waisted. Some have red bodies and black wings. Others are completely black. This type of wasp is a solitary creature. After mating, females dig small caverns into the ground using their legs and jaws. Inside the hole, an egg is laid and a plump, paralyzed caterpillar 'pillow' is placed inside with it. Once the wasp larva hatches, it consumes the immobile, living caterpillar. After a cavern has been filled, the female covers it with compacted soil to hide her treasure while it grows and develops. Adults drink flower nectar and can be found roaming over the ground in arid and semi-arid regions. They are active during the day and can sting in defense if threatened, but they are not considered aggressive.